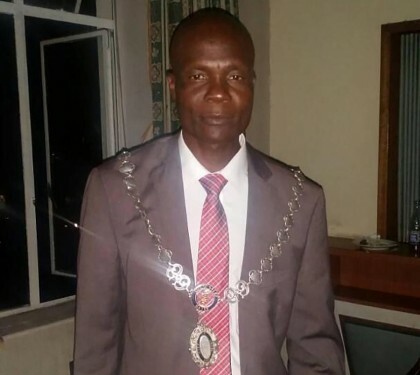 Josiah Makombe has been elected the new Mayor for the City of Gweru after being elected unopposed while Cleopas Shiri will deputise him, also elected unopposed. Gweru councilors were on Tuesday sworn into office which officially marks the beginning of their five-year term in office and end of the Enos Size-led commission which had been running the local authority. Makombe and Shiri were Movement for Democratic Change (MDC-Alliance) party choices as it was announced earlier Tuesday that they had been chosen by the party after interviews which were conducted in Harare last month, with only endorsement from the 16 other elected MDC Alliance councilors left. Speaking after taking the Oath of Office at the Council Chambers, Makombe said his was happy to land the the top job and his mission is to rescue the city from poor service delivery. “I’m overwhelmed by the support that I got and it’s not easy to lead such a City but I will do my best to ensure that all the problems that we have in this city are addressed as quickly as possible,” he said. Makombe was optimistic on his tenure looking ahead saying all stakeholders should come on board and assist the city as they will not be able to do it alone. “The best way forward is engagement of all stakeholders, the city is for us all and we need to come together and find solutions, the council cannot do it alone because we need to partner with businesses and all other stakeholders so that at the end of the day we achieve what we want, which is service delivery to the residents of Gweru,” he said. The new Mayor was quick to say all the problems bedeviling the city need urgent attention, highlighting some which are a priority to his new council. “All the problems that we have in this city should be addressed as quickly as possible. We have problems of roads, problems of water as you know we have a typhoid outbreak and my condolences to families that lost their loved ones and we have to make sure we address that, and we also have a problem with refuse collection,” he said. Mayor Makombe went on to lament that Gweru is a city in darkness as far as lighting in concerned. “We have a problem with traffic lights which we need to solve and above all the city is in darkness we don’t have street lights in town and it’s not anything which we should be proud of,” he said. Makombe was selected and elected ahead of four other candidates who included former Mayors Hamutendi Kombayi and Charles Chikozho, businessman Albert Chirau as well as Cleopas Shiri who eventually settled for the Deputy Mayoral post. Meanwhile, Wrd 10 councillor Angeline Kasipo has become Kwekwe’s first female mayor. She will lead 13 other councillors. “I feel humbled by the gesture and the confidence that the people of Kwekwe have shown in me. I promise to repay them through servant leadership. I will be there for the people,” Kasipo said.